I have a new favourite breakfast recipe! In the past you have seen me obsessing over overnight oats, oats idlis, nice thick fruity Smoothies and Smoothie bowls and even Cheelas. 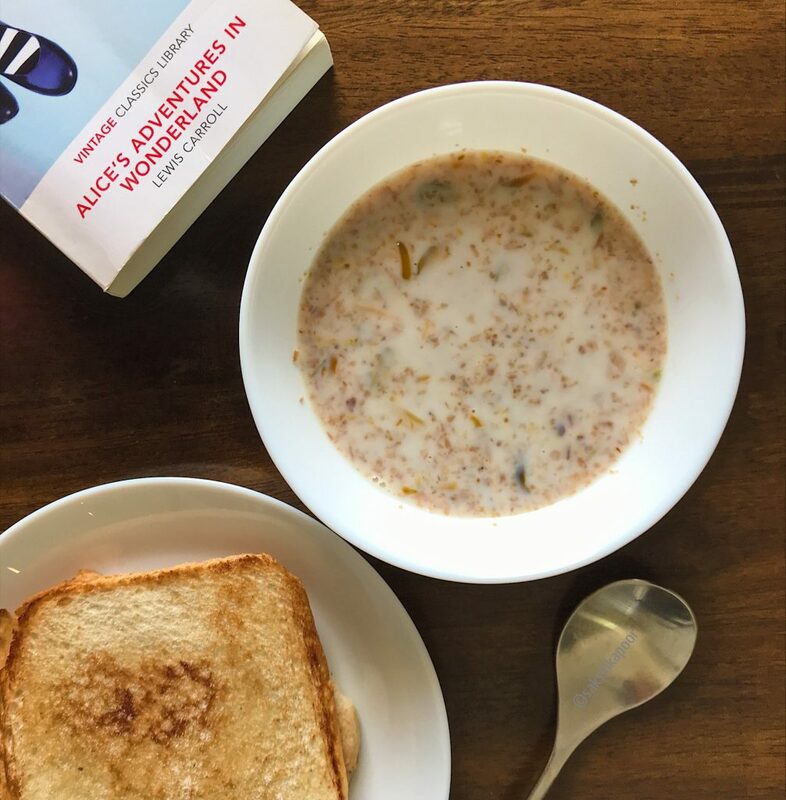 But ever since I revisited the breakfast from my childhood, Dalia and Ghee toast, I have been experimenting with it and making variations. I have lately been using Bulgur instead of Dalia as it cooks faster and also because I find it easily in my local supermarket in Dubai. 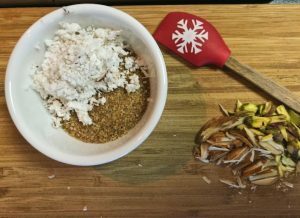 I’m happy to tell you that those experiments finally bore fruit and I now make a yummy Bulgur Porridge with Toasted Coconut! I have previously shared an open pot method for making bulgur porridge but this one comes with slight variations. If you notice these Instagram posts here you’ll notice that I still call this Dalia porridge but actually I have used Bulgur in most of them. I find that Bulgur cooks quickly and is great for an easy breakfast when you are running against the clock in the morning. I do try and use a variety of nut milks in this Bulgur porridge like walnut milk, pistachio milk besides the classic Soy milk. I’m not vegan but I do enjoy trying these new milks. I do however wonder about the implications of the mass production of nut milks. Almond production requires a lot of water and is therefore is not considered the most sustainable. Soy milk is often not free from GMO. And mass production of Dairy milk in farms, as most people already know is not the cleanest business, ethically and environmentally. So what choice does one make? I still consume dairy along with some Soy milk occasionally. Did you know that there are companies making milk out of split peas? They extract the protein from the peas and prepare a “milk” that is low in sugars and high in protein. Do tell me your thoughts on dairy and non dairy milks and the choices you make, in the comments below. As for this Bulgar Porridge recipe, you can use whatever milk you like. 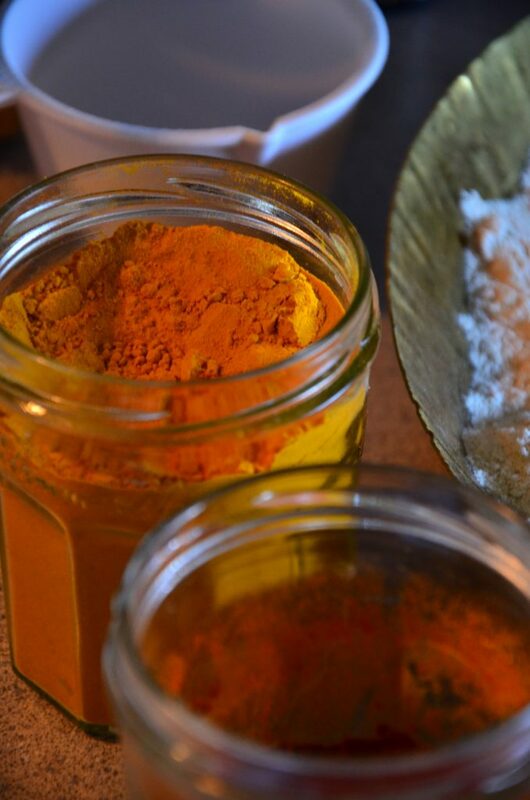 I usually stock a box of shredded coconut in my freezer for use in coconut based curries that I have learnt from my Mother in law like the Ripe mango curry, Coconut Chicken curry and more. But since I make those curries occasionally, I have been looking for uses for the shredded coconut. That’s how I came up with the idea for toasting the shredded coconut with the Bulgur while making the porridge. First, gather and measure all the ingredients. Next, place a saucepan on medium high heat. Then add the measured bulgur, shredded coconut and nuts in the pan. After this, roast the contents of the pan on medium high heat by stirring continuously. This should take approximately 5 minutes. Within 5 minutes you should be able to smell the toasty aroma of coconut and bulgur. If you feel the contents are burning, reduce the heat to a medium low and continue stirring. Once the coconut and bulgur are nicely toasted, add water and stir. Reduce the heat to low and let the bulgur cook till very little water is left. This should take another 3-4 minutes. When the water has reduced and the bulgur is soaked, add milk of your choice. If you are using a non dairy milk, you make take the pan off heat. I usually add low fat dairy milk and let it become steaming hot. Add chia seeds (if using) now and stir them in. Finally, transfer the Bulgur Porridge with Toasted coconuts in a bowl. Enjoy this Bulgur porridge with Toasted Coconut with the side of a ghee toast for a hearty breakfast! When the water has reduced and the bulgur is soaked, add milk of your choice. If you are using a non dairy milk, you make take the pan off heat, else just heat for a couple of minutes after adding dairy milk. If using chia seeds, now is the time to add them and stir them in. Finally, transfer the contents in a bowl.